We’ve let the arts fall by the wayside recently. The Peeps have been so busy with academic pursuits it seems like creative endeavors have been pushed aside. Well, that’s not entirely true…Peep #1 is an avid writer, and enjoys working on his stories; Peep #2 has always been very creative, and is constantly decorating the walls of her room, her belongings, and herself! (See her most recent transformation in the photo below– red hair!) But I’m talking about a more formal artistic pursuit, and so when a friend and fellow homeschool mom invited us to come spend some time in her pottery studio once a week for the next couple of months, I jumped at the chance. 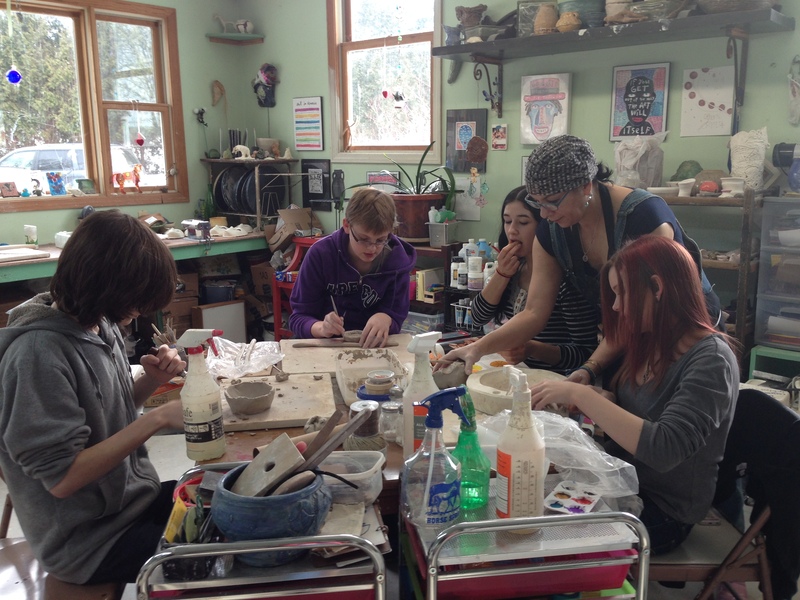 I was looking forward to it for myself as well– pottery is always something I’ve wanted to try. So, last Thursday we arrived at the studio attached to the side of her house, ready to play in the mud! My friend P’s studio is large, warm, sunny and bright with shelves teaming with books on pottery and art. Pots in various stages of completion rest along the sills and floor and immediately lend inspiration to n00bs such as ourselves. P’s passion is ancient pottery, particularly Minoan and Greek, and some of her replicas blew us away. She is also passionate about technique, and promised us a demonstration of an ancient firing method, which happens in a huge fire pit, once the weather warms enough so that we can go outside. So, with a bit of history and inspiration in hand, we were ready to begin. And start at the beginning we did! Mastering kneading and preparing the clay didn’t take much time, but oh, the dreaded pinch pot! We’ve worked on these at home before with varying degrees of frustration (usually mine). After several failed attempts (and as I watched my offspring deftly complete theirs and move on to coils), P surreptitiously produced a mold for me to push the clay into. I was not too proud to accept and happily finished what will hopefully be a rather nice serving bowl. But, not to be beaten by a kindergarten skill, I cut off another hunk of clay and took another stab at the pinch pot. Under P’s gentle guidance I successfully finished a sturdy, though rather lumpy, sugar bowl/salt cellar/pencil cup… haven’t quite decided yet what it’s going to live its life as. 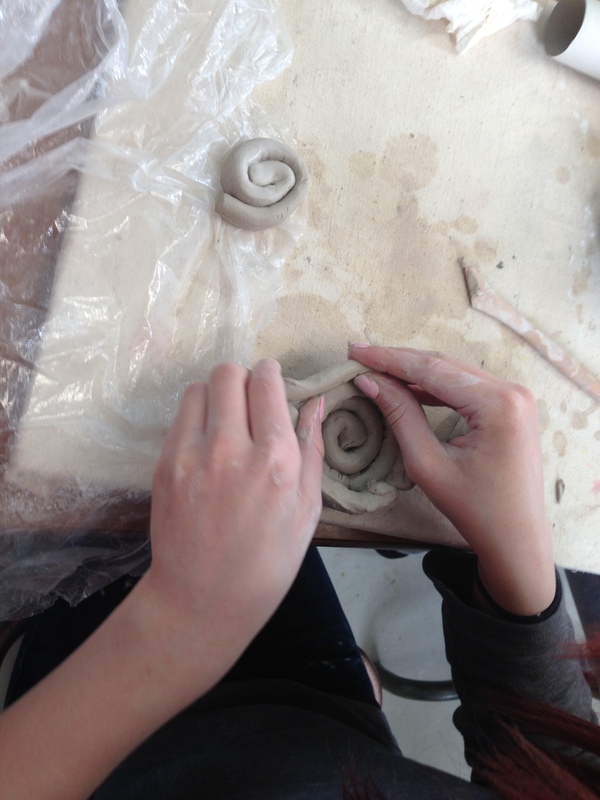 After the pinch pots and coiled bowls, she had us move on to a more advanced skill– hollow pieces. These are shaped with slabs of clay that are rolled flat and folded into shape– in this case, a large seed pod. Very cool and I’ll be interested to see how they turn out. All of us were casting longing glances at the pottery wheels, but we’ll have to wait until we have a little more skill under our belts before we attempt to “throw clay.” That’s a good thing, I think– we want to do it right, and going through the smaller stages is all part of the process. It also means more days in that beautiful studio, filled with music and talk and the wonderful smell of P’s dinner drifting in from the adjacent kitchen. Yeah, I can do with more of that.